The commander of the Landivisiau Naval Air Base has formally taken delivery of the French Navy’s first Rafale to the new standard F3-R. Converted by the Landivisiau detachment of the AIA Bretagne aviation workshops, the Rafale Marine s/n 30 was delivered to the aerospace technical support group to be prepared and handed over to the given to the fighter detachment of the CEPA / 10S squadron. The upgraded aircraft made its first flight from Landivisiau air base on Dec 17, 2018, at 16:15 hours. 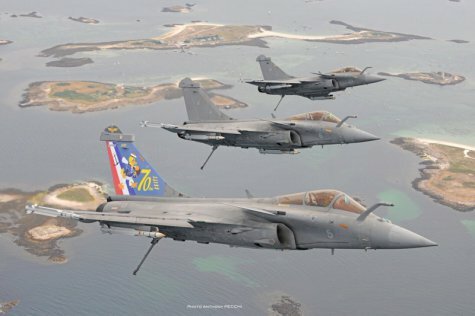 It will initially be operated by CEPA / 10, which will carry out a number of trials which, if successful, will then allow the Naval Aviation command to declare the operational commissioning of the Rafale F3-R standard, which will initially be operated by Flotille 11F (11th Naval Air Squadron), the first unit to operate this aircraft standard. The new Rafale F3-R standard brings new capabilities in the areas of intelligence, communication, combat and command. If the integration of the Meteor long-range missile and the new-generation Talios laser designation pod are the major innovations, other developments (mainly software) in embedded systems allow the aircraft to evolve. The F3-R standard also includes the installation of an Automatic Ground Collision Avoidance System (AGCAS) and various improvements to the RBE2 radar, the Spectra electronic warfare system, the Reco NG pod and the inertial navigation system. With the F3-R standard, the Rafale Marine will also be equipped with a new-generation air refueling pod, which will allow the aircraft to use the laser-guided version of the AASM (armement air-sol modulaire, or modular air-to-ground weapon) air-to-surface precision weapon.